Stitch Maps » News » Big changes! Keep in touch! Subscribe to our news feed, or to our feed of recently-added patterns. Join our Ravelry group, or like our Facebook page. Want to contribute to the collection? Start by checking out our knitspeak guide. You’ll be glad you did: it’s full of useful tips, examples, and explanations. 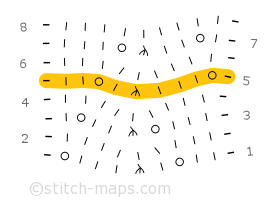 Consider getting a basic subscription if you want to view stitch maps with your current row highlighted for you. And now, for a public service announcement: Though Stitch-Maps.com has only just taken its first toddling steps out in the real world, it’s sure to outgrow its britches soon. Plans are afoot to move the site to a new host that ought to offer better performance. In the meantime... please be patient with the site! Thanks! More new flashes as events warrant!